A VAT refund can be claimed by any non-Thai visitor who departs Thailand by air carrier from an international airport like Suvannabhumbi Airport but cannot be claimed for commercial shipments that foreigners wish to send home eg. timber, paint, . 1. 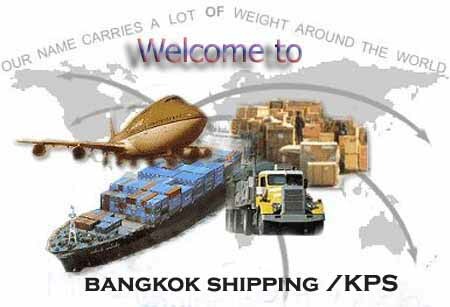 VAT refund only applies to goods taken out of Thailand within 60 days from the date of purchase. 2. The goods must be purchased from stores displaying the "VAT REFUND FOR TOURISTS" sign so when buying check which stores show the VAT. 3. On any day, the value of goods purchased at each participating store shall not be less than 2,000 baht, including VAT. The total amount claimed for refund must not be less than 5,000 baht, including VAT. 4. On the purchasing day, present your passport and ask the sales assistant at the store to complete the VAT Refund Application for Tourist form (P.P. 10) and attach the original tax invoices to the form. Each application form (P.P. 10) must show a value of 2,000 baht or more. 5. Before departure, present your goods and submit the VAT Refund Application for tourists (P.P.10) form and original tax invoices to the Customs officers for inspection before check-in. We as shipping agents cannot do this as the VAT wish to see the person on the passport. 6. Valuable goods, such as jewelry, gold ornaments, watches, glasses, or pens must once more be inspected by the Revenue officers at the VAT refund office at the departure lounge after passport control. 7. You can either present your claim to the Revenue officers or drop it into the box at the Refund Counter or mail from your home back to the Revenue Department of Thailand. You can choose to receive your refund by not exceeding 30,000 baht cash in Thai baht, draft, credit to credit card account You must specify the method of receiving the refund on your form (P.P.10). • For cash refund, a fee of 100 baht. • For draft refund, a fee of 100 baht plus draft issuing fee at the rate charged by banks, and postage. • For credit to credit card account refund, a fee of 100 baht plus money transfer fee at the rate charged by banks, and postage. • Allow yourself adequate time at the airport for the refund process. Concouse D, Gate D1-D4 and D5-D8 at the 4th Fl. Passenger terminal, the 4th Fl., behind check in counter, Row H.
Buddha heads are very sentitive for Thais to send so be aware as many shippers will not ship because one item may be a head that now needs to be cleared by the Dept of Fine Arts and the Customs.We can provide the necessary documentation to send out of Thailand.